Yarra Junction is a rural township 2 km east of where the Little Yarra River joins the Yarra River, 55 km east of Melbourne. It is on the route between Lilydale and Warburton, and a road branches southwards from Yarra Junction to the timber towns of Noojee and Powelltown. 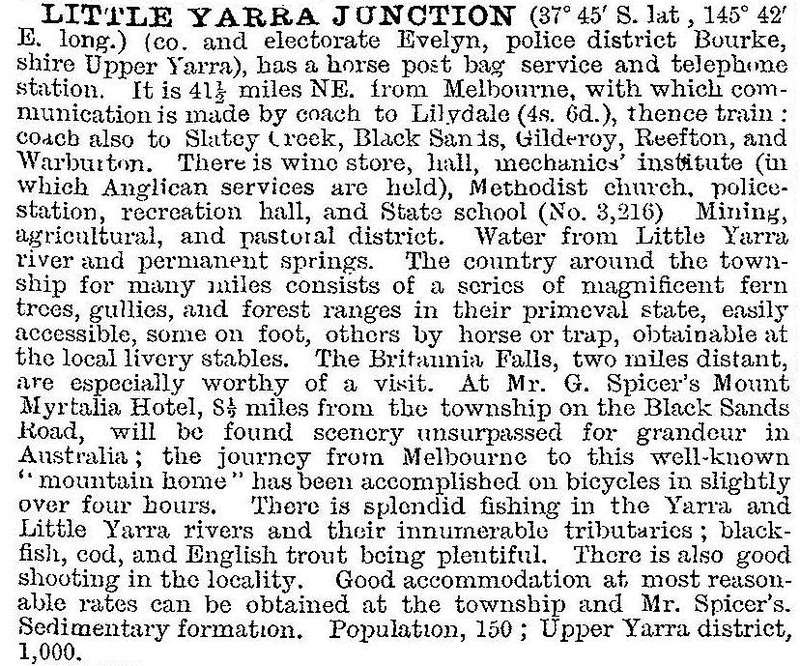 Yarra Junction was a conveyance point for timber brought in by bush tram from Noojee, Powelltown, Brittania Creek and several smaller settlements to the south-east. Its growth began to approach Warburton’s, and in 1910 the administrative centre for the Upper Yarra shire was shared with Warburton, and later transferred to Yarra Junction. Yarra Junction’s centrality to the region was strengthened in 1961 when the Upper Yarra High school was opened there. Yarra Junction has a range of shops, churches and community facilities along the south side of its main street (the Lilydale-Warburton Road). On the other side of the road, the former railway line (closed 1965) is a walking track adjoined by a substantial reserve with bowling greens, tennis courts, oval, a community centre and the Upper Yarra historical museum in the old railway station. Further out of town there are a nursing home and hostel, St Joseph’s Catholic school and the Little Yarra Steiner school on land as large as the town centre. Yarra Junction primary school had 236 pupils in 2014. Further west, along Tarrango Road, there are Camp Eureka (1945), built by the Youth Wing of the Communist Party, and the Brittania Park Guides’ camp. Camp Eureka is heritage listed.